A new study by researchers at Johns Hopkins University and Ripon College reveals that dogs go out of their way to comfort their owners. In a report titled, "Timmy's in the well: Empathy and prosocial helping in dogs," published Tuesday in the Learning & Behavior journal, researchers reported that dogs pushed their way through a door when they heard their owners crying. "We found dogs not only sense what their owners are feeling, if a dog knows a way to help them, they'll go through barriers to provide to help them," said lead author Emily Sanford, a graduate student in the Department of Psychological and Brain Sciences at the Johns Hopkins University (JHU), according to a Tuesday JHU blog post. "Every dog owner has a story about coming home from a long day, sitting down for a cry, and the dog's right there, licking their face. In a way, this is the science behind that," Sanford added. In the experiment, the owners of 34 pet dogs of various breeds and sizes were asked to stand behind a clear door held shut with magnets weak enough that the dogs could easily swing it open with their noses or paws. Almost half of the dogs were certified therapy dogs. The owners were told to either hum "Twinkle, Twinkle Little Star" and say "help" in a normal tone every 15 seconds or say "help" in a distressed tone every 15 seconds while making crying sounds. The researchers found that a similar number of dogs in each section — nine in the humming group and seven in the crying group — opened the door. However, the results also revealed that dogs who heard their owners crying opened the door three times faster (23.43 seconds on average) than dogs whose owners were humming (95.89 on average). There was no variation in how the dogs responded depending on their age, breed or certified therapy status. "While we don't know for sure whether other factors motivated the opening, what we can say is that dogs in the crying condition opened much more quickly than dogs in the humming condition, which suggests that they are taking an action when their owner is in distress," Julia Meyers-Manor, senior author of the study and assistant professor of psychology at Ripon College in Wisconsin, told ABC 7 Monday. Throughout the experiment, the researchers also measured the heart rate variability of the dogs and kept an eye out for behavioral signs, such as barking or panting, that might suggest that the dogs were stressed during the study. 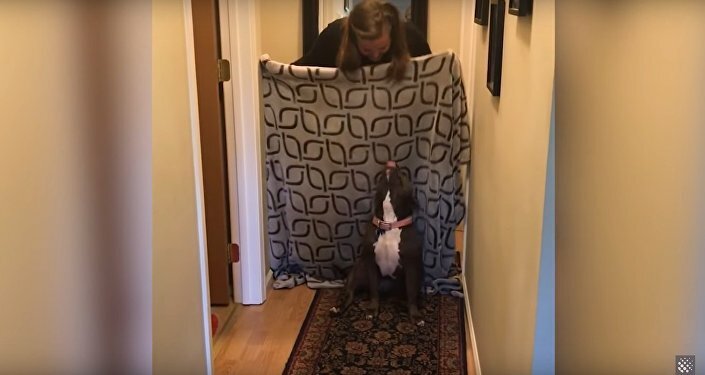 The results revealed that dogs who were able to push the door open to "rescue" their owners exhibited fewer signs of stress. Dogs who didn't push open the door showed the most stress. "The idea is that if you can perceive someone else being in distress but it doesn't overwhelmingly stress you personally, then you're more likely to be able to provide help," Sanford said, Good News Network reported Tuesday. "That explanation fits really nicely with our evidence that the less-stressed dogs were helpers, the really stressed dogs were not helpers, and there was no similar pattern of stress and opening in the control condition. It makes us think that there was actually an empathetic response," Sanford added. "Dogs have been by the side of humans for tens of thousands of years, and they've learned to read our social cues. Dog owners can tell that their dogs sense their feelings. Our findings reinforce that idea and show that, like Lassie, dogs who know their people are in trouble might spring into action," Sanford continued. However, there are some limitations to the study. According to the report, the sample size of the experiment was small. In addition, there was a variation in the crying and humming of the owners, which could have also impacted the results. "The variability seen in the present sample may have had an influence on dogs' opening behavior," the study notes, adding that "future studies on helping with this paradigm could use pre-recorded audio clips of human vocalizations to standardize the emotional experience that each dog is exposed to during the trial."